In the early 1970s I moved to a house in Oakland near Lake Temescal. I lived there for several years while I worked at the Space Sciences Laboratory, on the hill above the U.C. Berkeley campus. My daily commute was something special; you can follow along on the Google Maps image above. To get to work I would take Highway 24 through the Caldecott Tunnel east towards Lafayette, and then take the Fish Ranch Road exit (A at bottom right). Fish Ranch Rd. went uphill for a mile through a series of soft left & right sweepers until it reached the intersection with Grizzly Peak Blvd. A right turn there led to a tight, complete 180 degree horseshoe turn to the left (B above). Grizzly Peak Blvd. climbed for another 3/4 mile then curved and twisted along the ridge of the Berkeley Hills, back and forth between the south side and north side of the ridge. It ran past Chaparral Peak (C) and the Tilden Park Steam Train on the north side. A soft left turn and a short straight and suddenly there were panoramic views of the S.F. Bay area as the road shifted to the south side. There was an especially good view at the area known as the Rock Wall (see lower photo). The road stayed on the south side of the ridge to get around Grizzly Peak (D). The road continued to twist and turn as it ran west by northwest. This stretch had Tilden Park on the right and undeveloped University of California land on the left. There was one really tricky left turn that was signed at 15 MPH and they really meant it (E above). I would really slow down for this one as there was a sharp drop off on the right; very bad things would happen if I overshot this curve. A few more lefts and rights and a long right horseshoe followed. Finally at the intersection with Centennial Drive I would take a left, then into the Space Sciences Laboratory (F). Going home was the reverse. It was only about four miles, but a great ride. There was plenty of turns to keep things fun, and some great views of Oakland, the Bay and San Francisco. When I was commuting there was no residential housing along the entire route, with open space reserve, parkland or undeveloped University property on either side of the road. There was little traffic in the mornings and not much on the route home. I rode my 350cc Ducati Desmo along that commute, and I put most of the 10,000 miles on that bike riding it twice a day and sometimes four times if I went home for lunch. I haven’t taken that route for many years but I presume it hasn’t changed much. Grizzly Peak Blvd. was a popular joyriding route on the weekends and I stayed away from it. On Monday mornings it was always interesting to see how many tire marks there were at that one true 15 mph turn. Most roads are engineered to have a certain rhythm and you can get ‘in tune’ with it. A turn that doesn’t fit in with the rhythm of the road can be a surprise if you aren’t paying attention, and you can find yourself with a too fast entry speed. Often there were fresh skid marks in the road and one time the tire tracks ran right off the road. After negotiating the turn I looked back over my shoulder and saw a car some distance down the hillside, resting on the shrubbery. Oops! An NCR replica Ducati at the Rock Wall. San Francisco is in the distance, the Bay in midfield and Oakland just beneath. Photo courtesy of Steve Allen/bevelheaven.com. I liked to take the wide radius left hand horseshoe sweeper (B in the image above) at maximum lean. One morning on my commute I was in the middle of that turn when a small bird flew up from the side of the road and into my path so suddenly I couldn’t dodge it without risking a crash or running off the road. Usually a bird manages to fly around the hard parts and you see it fly out the other side — not this time, though. Fearing I had run over the little thing I eased up and stopped. Looking back I could see the bird lying in the middle of the lane. I parked the bike on the shoulder and walked back toward the bird to check its condition. It stayed still until I got about five feet away. It then took off, weaving like a drunken sailor. Apparently the bird had gotten caught in the front wheel spokes and took a few revolutions around before popping out, unhurt but dizzy, as I slowed. Relieved and amused I went back to the bike and continued on to work. 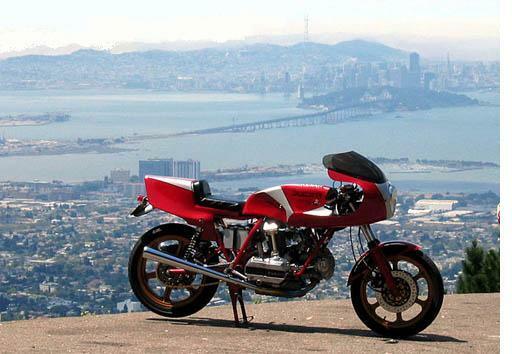 One of my favorite rides in those days was to take my Ducati Sport from work east through Tilden Park past Inspiration Point and take very twisty Wildcat Canyon Road down the east side of the Berkeley Hills toward Orinda. 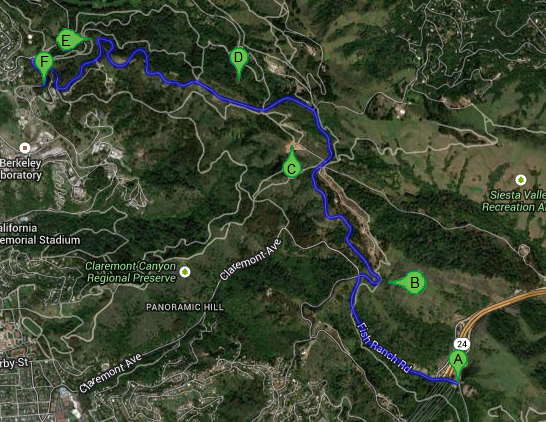 I’d cross San Pablo Dam Road then continue east on Bear Creek Road. 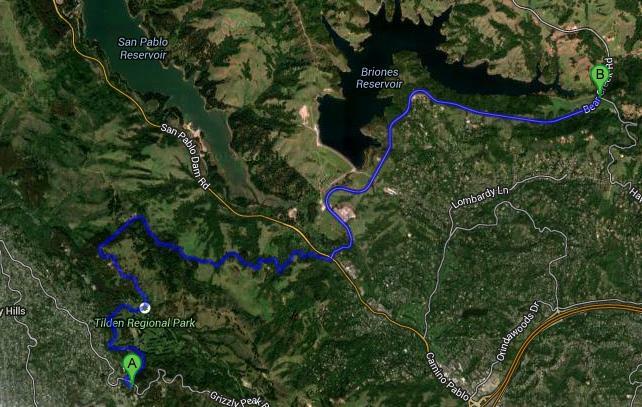 The road went around Briones Dam and reservoir, which was a fairly new dam at the time. The original Bear Creek road had been drowned by the water and the replacement road ran along the southern edge of the reservoir. The road was built to the current standards even though it served no more than a few ranches, and the result was a really nice wide and smooth road full of sweeping turns with almost no traffic. At the east end of the reservoir it re-joined the original Bear Creek road and became narrow and bumpy just like all the other old farm roads in the area, so I would turn around and ride the nice newer road in reverse. It was about 20 miles round-trip, a fun short jaunt that could be squeezed into a lunch hour. One day I took the ride and noticed something new. 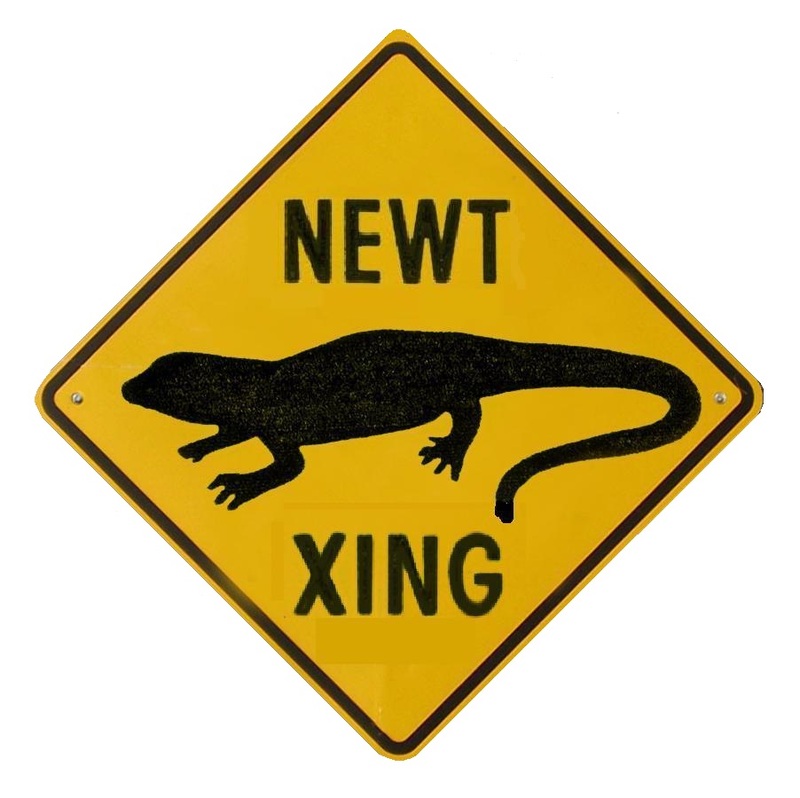 Just east of San Pablo Dam road was a sign that said “NEWT XING” (XING is California Dept. of Transportation shorthand for “Crossing”) with the image of a newt on it. At first I thought it was someone’s idea of a joke, so I turned around and stopped the bike next to the sign. The thing looked genuine with a sturdy steel pole in a concrete base. As near as I could tell it was a real Caltrans sign. I imagined someone would soon steal it because of its novelty. The sign looked something like this. I told a co-worker about this odd sign and he confirmed that it was for real. He lived in nearby Lafayette and had read about it in his local newspaper. There was an endangered species of newt in that area that lived in the damp environment east of the road but had to mate and lay their eggs in the water west of the road. During mating season they had to cross the pavement to reproduce. About a week later I went for a ride out Bear Creek Road again. The sign was still there and just past it someone had painted two white lines across the road about 10 inches apart. A newt crosswalk! I nearly fell off my bike I was laughing so hard. Just moved to the Bay Area and discovered these roads on my old K75. Some things never change, weekend joyriders are still leaving skidmarks at that 15mph turn on Grizzly Peak.